As a search engine, Google is a for-profit company that makes money off its advertising programs, AdSense and AdWords. Google’s business model rests on one thing: Trust. People go to Google rather than another search engine because they trust that, when they search for something online, Google is going to give them what they want. If people started losing trust in Google, they’d use another search engine, Google would lose web traffic, this would decrease the value of its advertising space, and Google would lose money. Therefore, Google constantly tinkers with its search engine to bring people what they want when they do a search – results that are relevant and important to their query. Over the past year and a half or so, Google has been rolling out, and then rolling back, customer reviews from its SERPs. These maneuvers highlight Google’s interest in using the feedback of its search engine users to find quality websites that are relevant and important to a given search query. However, the lack of consistency and the constant changes that Google has implemented show that they’re not quite comfortable with the logistics. Recently, though, these same customer review stars have been appearing among organic results, too. This shows how search engines are changing from traditional signals of a website’s quality to how users interact with it. It also opens up a significant opportunity for law firms that might not have made it into the local boxes to attract organic web traffic to their site. Whenever reviews of your law firm or your firm’s site appear on a results page, it can bring or repel potential clients. One study found that sites with a four or a five star rating attached to their organic listing in the results page had higher click-through-rates than those that had no rating, at all. This is crucially important because a vast majority of internet users read these online reviews, and are significantly influenced by them. Web traffic is, in itself, an SEO signal – search engines see high web traffic as a sign that the site is relevant and important for the search query that found it, and will promote the site in the future if the traffic is high enough. In simple terms, web traffic has a snowball effect with a website – the more visitors go to a site, the higher it will rise in the rankings, which brings in more visitors, which makes it rise, even more. 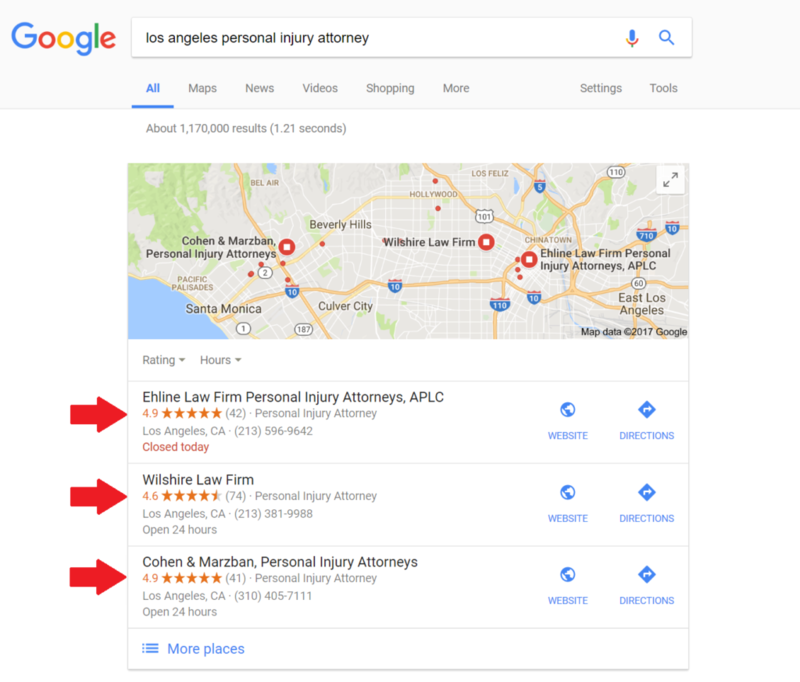 Unfortunately, the lack of consistency in Google’s rollout of its customer review program has made it difficult for law firm’s to utilize it effectively. However, because of the trend in search engines away from traditional SEO signals – like keyword density or backlinks – and towards user intent and customer-generated feedback, we expect Google’s customer review program to grow in importance over the coming months. Even if it might not seem important now, law firms would do well to start pushing happy clients to rate them online. Having a healthy portfolio of solid reviews when Google’s program hits the ground running can put your firm ahead of the competition in your area. This entry was posted in Legal Marketing, SEO and tagged Algorithms, Google, Organic, Reputation, Reviews, SEO Developments. Bookmark the permalink.